Knowledge of how long an injured person has in filing a claim against a cruise ship is crucial. Not doing so within the statute of limitations can be grounds for dismissing any personal injury claim. The deadlines are usually based on which state will be handling the claim and what type of claim it is. Yet, the contract formulated within the cruise ticket sets its own deadline for anyone who wants to file a claim. The average time for filing a claim is within one year on a cruise ship contract. But it is necessary to check that specific ticket to find out the exact statute of limitations; because they can be different for every cruise line. Notice of the injuries needs to also be given with specific cruise tickets. There are moments when a personal injury claim against a cruise ship can be “tolled”, basically paused. When a claim is filed outside the time limitation by the plaintiff, they might still be able to bring forth the claim but it is something that brings no guarantees. The best thing to do is file within the specific time given to avoid going through this. A case that uses the tolling concept is the Newell v. Carnival Cruise Lines. 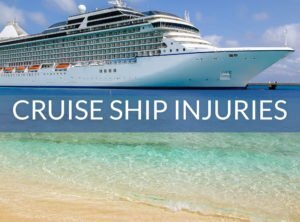 In this case, a passenger filed a claim against the Carnival cruise line after falling on a metal stand and suffering injuries. The passenger followed the two deadlines that were set out on the ticket: the notifying period and the filing period. She did so accordingly, but when she went to file the claim, it was done through the wrong department. She had filed it through the Eleventh Judicial Court for Miami-Dade County and by the time it was properly filed to the right department, the one-year period had already passed. The cruise line company moved for a dismissal because the statute of limitations had been over, but the court ruled that equitable tolling was to be applied to the case because the passenger had taken all the steps necessary to file the claim within the time that was provided but mistakenly filed in the wrong department. This was decided because she had taken the action to file the lawsuit. Promptly filing a lawsuit against a cruise line company is vital for any claim that wants to be brought against them. Victims need to be aware of the contract details within their cruise line tickets and place the claim and notice before the specified times. By not doing so, the victim loses their rights in being compensated for any damages that they endured while on board the cruise ship. With a litigator from Percy Martinez Law firm, no deadlines would ever escape the victim. Their experience and knowledge will work hand and hand in fighting for the victims’ rights and compensation. Visiting, calling, or emailing their law firm is the first step in recovering what has been done to a victim.